I have lines representing curving streams (blue line in the Picture) and want to angle symbols perpendicular to the angle in their particular Locations (point features symbolized as red lines in the picture). With Layer Properties - Symbology -> Advanced I can use a field Expression to rotate my Symbole as desired. I therefore Need to create a field in the attribute table with the correct angle-number in it which I then can sue in the field expression. 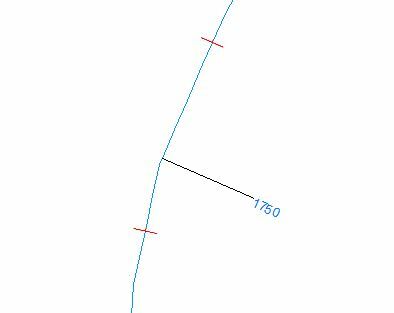 Does anyone know, how I can formulate an Expression which tells me the angle the Point has to rotate to be perpendicular to the line? I work with ArcGIS 10.2. There is no calculation that can do that. Fortunately this is built in to LR point event layers. Convert your lines to Routes using the Create Route tool, locate your points on the line as an event table using the Locate Features Along Route tool, then use the event table to build a point event layer using the Make Route Event Layer tool with the Angle option. If you export that layer from the Table of Contents it will become a normal point feature class that has all of your point attributes along with a LOC_ANGLE field that tells you the normal angle to the line. The angles will be Arithmetic angles (counter clockwise beginning at East). This angle can be used to rotate your symbol. 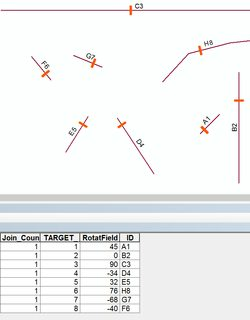 In my opinion all users that regularly do work with linear networks that have related point or line features along them should be familiar with the LR toolbox tools. You can do that with some arcpy. 1) You need to do the Spatial Join between the points and the lines to transfer the ID value of each line to each point. 2) Find out the closest vertex of the line and the input point. 3) Calculate the direction of this segment. 4) Update the rotation field of the points (with joined line ID). You can do that very easy by using the NEAR-Tool from the ArcToolbox with the optional parameter "Angle" checked. Whether you add a double-field for your Angle and calculate it by subtract 90 degrees from the field NEAR_ANGLE (added from NEAR-Tool) or you use the field NEAR_ANGLE directly and subtract the 90 degrees by the Expression Builder inside the Rotate properties. Not the answer you're looking for? Browse other questions tagged arcgis-10.2 field-calculator point symbology perpendicular or ask your own question. how to apply same color ramp to two line symbols? ArcMap arrow symbol for point: how to make the arrow end starts from the point instead of sitting in the middle of point? Rotating end cap in water network?